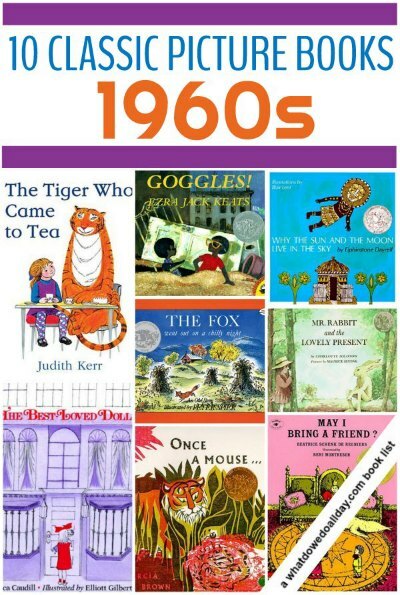 Previously I compiled a list of 1960s children’s books as part of my series of classics for each decade of the 20th century. It’s fun to share vintage books and since that series featured chapter books I want to extend it to include some of my favorite 1960s children’s picture books. I’m not so ambitious this time to do the entire century in back to back posts. What I will do is a few decades as I can get to them, and not necessarily in order. I’m starting with the 1960s, since that was the most popular of the corresponding chapter book lists. I will remind the regulars (Hello! Thanks for sticking around!) and inform the newbies (Welcome! Stick around!) that these are not lists to recommend books you already know, neither do I claim they are the “best” books. (What constitutes “best” is always subjective.) No need to leave a comment telling me I forgot Where the Wild Things Are and The Snowy Day. These are vintage books that you may not know yet! I’m also limiting these books to titles that are still readily available (except for one I can’t resist) since it’s no fun getting recommendations for books you can’t easily find. Note: My kids and I chose these titles, affiliate links are included. The Best-Loved Doll. (1962) This is one of my most favorite books from my childhood. I can’t even tell you how many times I read it. Betsy’s doll is rather worn out from all the love it receives. When Betsy is invited to a doll party she worries that her doll will not be up to snuff, and won’t win one of the promised prizes for best dressed doll, or most talented doll. She takes her favorite doll anyway, with marvelous results. I loved this book so much as a girl that my mom even threw a Best Loved Doll party for me and my friends. Years later, my friend whose toy won the “best loved doll” prize told my mom she always remembered and treasured that prize. Once a Mouse…. (1961) Brown is possibly best known for Stone Soup, but don’t miss this one; it was also on my list of folktales from India. The wood print illustrations are extraordinary. It is based on an Indian fable about a hermit with magical powers. The hermit saves a mouse by turning him into different animals, but when he becomes a prideful tiger, he must learn a lesson in humility. One thing I like about these types of fables is that the moral lesson is nestled in a layered tale. Morals can work their way into little minds but parents don’t have the bore of reading a groan-inducing didactic story. The Tiger Who Came to Tea. (1968) What I like best about this story is that it is just a simple, enjoyable tale. There is no attempt to sneak in a didactic message or moralize about children’s behavior, fears or desires. It’s just a fun story about a friendly tiger who shows up one day, eats all the food and goes on his way. As a result the family has to go out to eat. There’s just enough absurdism to keep things clever but not enough to overpower the story. A wonderful classic. May I Bring a Friend? (1964) Each day of the week, the king and queen invite a boy to join them at a palace, and with each invitation the boy asks if he can bring a friend. Gracious as they are, the royal pair respond in the affirmative. Each day a new group of animals accompanies the boy to the palace. The fun, rhyming, cheerful repetition is a bit addictive and the illustrations of the animals’ antics a silly delight. The porquoi tale, Why the Sun and the Moon Live in the Sky (1968), is also on my list of African folktales for kids. Water wonders why he is never invited to Sun’s house. Sun replies that his house is not large enough and sets out building a new one to accommodate his friend. But when water comes to visit, he fills the entire house and there is no longer room enough for Sun and his spouse, Moon. Can you guess where they found a new home? I particularly like the illustrations, with their emphasis on the mask. The Fox Went Out on a Chilly Night. (1961) I must say it’s quite enjoyable creating a book list full of all my childhood favorites. Peter Spier illustrated the classic folk song about a fox in search of his dinner. Spier’s illustrations are a delight, alternating between black and white and color spreads. Of course, after you read it, be sure to find a recording of the song to share with your kids. Marigold and the Dragon . (1964) I loved this book as a kid and I don’t know what’s worse, putting a book on this list that you will have trouble finding or the fact that this book is out of print. If you can track down a copy, make sure it is the original 1964 edition. (A later edition was published in 1988.) I found a copy through interlibrary loan, and the extra effort is worth it for this tale of a plucky princess who is tired of everyone telling her she can’t do anything. She finds a dragon in the forbidden tower and sets off on a quest to help him turn back into a prince. It turns out he’s not a prince after all, for which she is quite relieved. After all, a dragon is much more fun. Goggles! (1969) stars Peter (from Keats’ best-loved book The Snowy Day) and his friend Archie. The pair find a pair of abandoned motorcycle goggles but a couple of big boys try to take them away. Peter and Archie, however, (along with Peter’s dog, Willie) are clever enough to evade the bigger kids. Mr. Rabbit and the Lovely Present . (1962) I’ve given this book as a gift to a lot of preschoolers. A young girl wants to give her mother a special present so she asks a rabbit for advice. The rabbit asks what her mother likes and when the girl responds with various colors, the rabbit suggests some items. It would appear that the rabbit is really not going to be that helpful because his suggestions are a bit unrealistic, but for each color the pair finally hit on the right item and by the end of the story the girl has a lovely present for her mother. « Construction Coloring Page for Kids Who Love Diggers! Mr Rabbit and the Lovely Present was one of my absolute favourites as a kid, and is now one of my kids’ absolute favourites. I can’t decide which of the gorgeous spreads is my favourite. Was stunned to discover a few years back that Maurice Sendak was the illustrator. That surprised me, too. The illustrations are different than his usual work, but then once I realized it was him I could see his style. I love that he was such a versatile illustrator and storyteller. Have you read The Sign on Rosie’s Door by him? Yet another departure from ‘type’! I’ve never read that one, I’ll need to check it out. Thank you. Way, way, way before your time. You’re bringing back such good memories. But I’m thinking, “What those are from the sixties?” Time flies! Okay, just one more . . . “The Hungry Thing” by Jan Slepian and Ann Seidler. I think that one is from the 60’s as well. It’s one of my 10 favorite read alouds. So much fun! Oh! I almost put Rain Makes Applesauce on the list. (soooo hard to limit myself to 10) I don’t know The Hungry Thing. It sounds fantastic. Thank you for the recommendation. It’s interesting that the 60s picture books don’t seem to hold the attention of kids these days as much as earlier picture books like Harry the Dirty Dog or the Madeleine series. I personally love May I Bring a Friend? but my kids did not like the illustration style. I’m not sure I would completely agree with that, though. There are certainly books from all decades that are boring or those that keep kids enraptured. My kids loved all these books, but found Madeleine totally boring. 🙂 However, neither of them liked Where the Wild Things Are, so obviously they have odd taste! Great list! We read several books from it, and I was always intrigued with how different both illustrations and font look in those books. Only 50 years and such a difference! Great list. How many of these do you think would get published today? Even though I wasn’t born until the 70’s my grandma loved to share stories with me and I remember her reading several of these titles. Thanks for bringing back many fond memories from my childhood. They are wonderful books, aren’t they? Thank you for reminding me of The Best-loved Doll! I remember that book! Do you know of a book from the 60’s called “Where oh where are my red button shoes?” Or something along those lines? It was my favorite, but I only vaguely remember it. I would love to track it down. Can you help?